On August 1, I began my new work with Bluestone Farm, a small organic farm in Brewster NY, which is run by the Community of the Holy Spirit, an Episcopalian order of nuns. I've been volunteering here all spring almost every weekend, and finally decided that it was time to dive in, to learn what I could learn, to support their work, and to make a new way for myself. I've been writing updates about the farm and this transition on Facebook and Twitter (and posting photos on Flickr), but now will be writing regular posts to this blog. There's a long story to tell here, involving my own awakening to sustainability and our shared future on this planet, the sisters' eco-spiritual project and their relation to the larger food and environmental movements, the many people who visit and are touched by the nuns' work, and my reviving spirituality. But I don't have a coherent narrative yet, so perhaps a blog is the best way to "write down the bones" and see where the writing takes me. So: to begin. A brief description about the rhythm of the farm, a new rhythm for me. 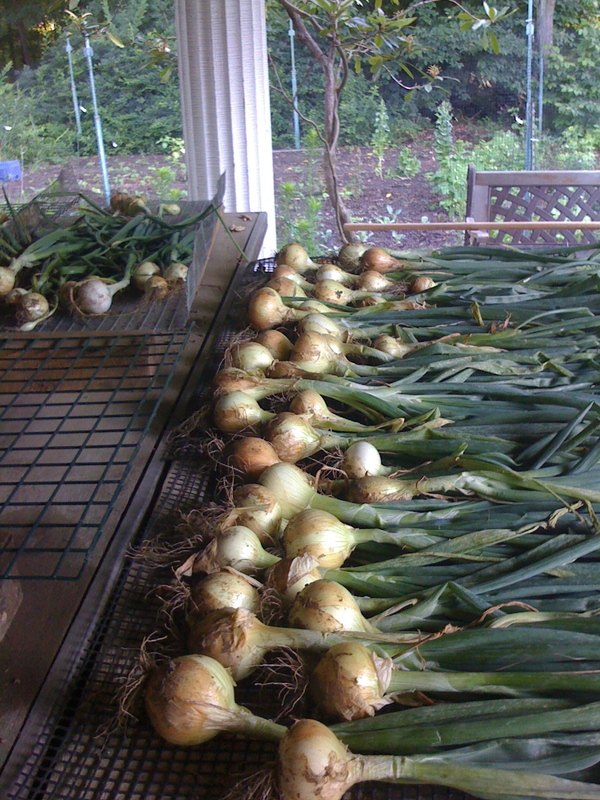 This weekend began as the last eight or so have, with an early morning harvest that we prepped to sell at the local farmers market. The market is small, with five stands: the bakers, the honey guy, the Italian cheese/meat/pasta folks, and another (larger, non-organic) vegetable stand. Click here for pictures of previous weeks. We like to call our produce "twice eaten" because, as you can see it's a bit holey--it's been munched by bugs, and then it gets munched by us. We start harvesting at 6:30, after a short chapel service called "Lauds." Then we head out with our scissors and baskets, and harvest lettuces, kale, chard, collards, mustard greens, carrots, beets, herbs...whatever's ready. We also sell duck and chicken eggs, spices, jams and maple syrup. All organically produced, although we're not "certified organic" because of the cost involved. The day is packed with farmwork, but satisfying. The best part, for me, is talking with people at the market who are kind of new to vegetables. They know they should be eating more greens, but aren't really sure what everything is and how to prepare it. I try to give everyone simple recipes, involving only a few ingredients...One of the things I hope to do with this blog is set down some of those recipes, along with pictures of yummy dishes we make here. This Sunday, we harvested oats...something new for all of us. 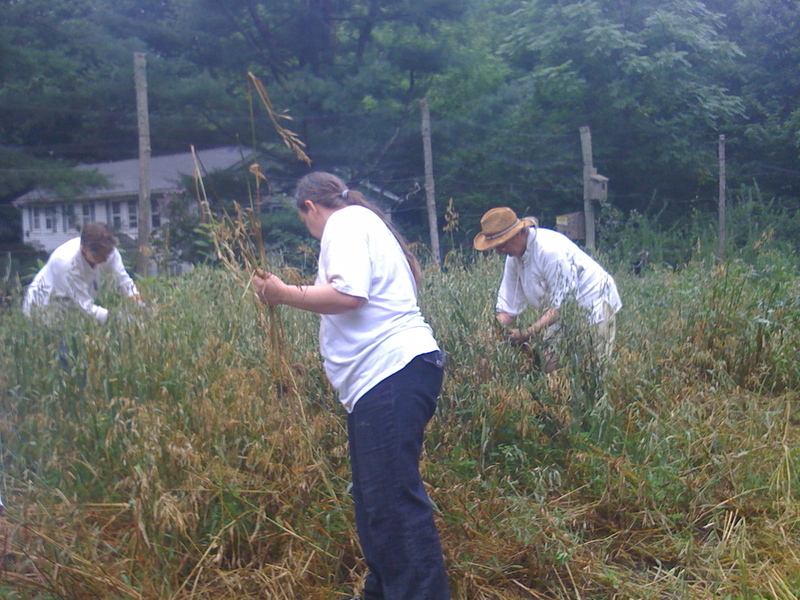 This is the first year the sisters have grown oats, so we all are finding our way around how to harvest and dry them. We had hoped for sun, but it was cloudy and started drizzling about an hour in. We were able to bring in more than half of the field, load it in the truck, and then bundle it into shocks back in the barn. The barn smells amazing now, as the oats are drying out and getting ready for threshing. This is a new rhythm for me, to be sure. I'm getting glimpses of a rhythm that's following and responding to large, powerful forces--the sun, the seasons, the cycle of life. It's a rhythm available to all of us, if we take a minute to comprehend just how small we are in this universe, and if we stop, and look, and appreciate just how beautiful this world is.